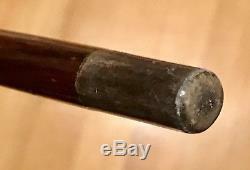 Up for sale is a rare vintage antique Late 19- early 20 century presentation walking stick cane. Beautiful gold filled top without any damage about 2 in length. Then carved octagonal mahogany wood with floral motif for 5 3/4. And then gold filled engraved GM collar 0.5 long. Then regular round shape mahogany shaft. Overall Measuring 37 in length. 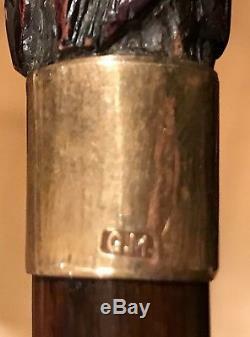 Original Horn ferrule 1 1/4. Please see photos as part of the description. We carry large collection of vintage antique walking canes. Please check out our other listings! 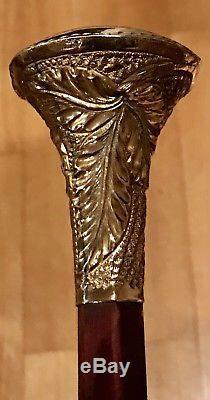 The item "Vintage Antique 19C Walking Stick Cane Gold Filled Handle Carved Wood Horn Old" is in sale since Thursday, January 18, 2018. This item is in the category "Clothing, Shoes & Accessories\Vintage\Vintage Accessories\Canes & Walking Sticks".